For the fans...from the fans. Will the Lakers Continue to Run? In case you happened to be living under a rock, on a 3-month vacation to the moon, or both, the big news for you would be the Lakers signed superstar Lebron James this summer to a 4-year deal. Since coming to the Lakers, the constant word from management to the players is they want to run this year. Last year, the team was tied for second in the league in pace. The team was quite young, giving heavy rotation minutes to Brandon Ingram, Lonzo Ball, Kyle Kuzma, and others. 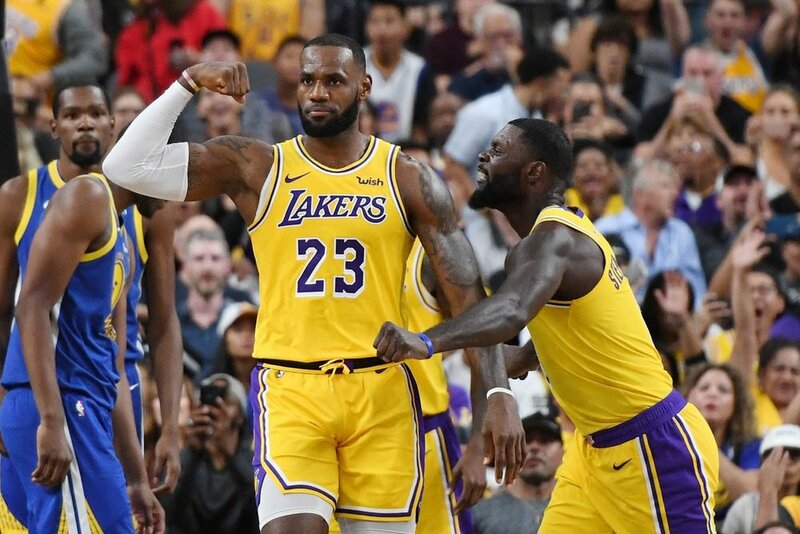 This year, however, the Lakers have not only added James who led the league in minutes played last year, but also veteran journeymen Lance Stephenson, Rajon Rondo, Javale McGee, and Michael Beasley who James so affectionately dubbed MUD (misunderstood, under-appreciated, determined). The question is will 34-year-old James continue to push the pace this year? How will Luke Walton divide out minutes between his vets and his young guys? It will be interesting to see if James will continue to lead the Lakers in their high paced offense. Who is going to start for the 76ers? Last year, the Sixers rolled out a deadly lineup of Ben Simmons, Robert Covington, JJ Reddick, Dario Saric, and Joel Embiid. That lineup was lethal, finishing the year with a +22 net rating, tops in the league for lineups that played over 35 games. Coach Brett Brown, however, switched things up in the preseason and started second year mystery man Markelle Fultz. Fultz had a decent preseason, shooting 43% from the field but only hitting 1 out of 5 threes. It’s a big bet for Brown to tinker with what was working last year but may be the right choice to give Fultz some confidence moving forward. If Fultz struggles early, will Brown replace him with Reddick or will he keep Fultz in the lineup? What will San Antonio Look Like? “…but in this world nothing can said to be certain, except death, taxes, and the San Antonio Spurs in the playoffs.” Benjamin Franklin wrote this in a letter to Jean-Baptiste Leroy in 1789 and is something that most people have generally regarded as true ever since. The last part (which Franklin may or may not have said) is in serious doubt this year. After trading Kawhi Leonard, watching Tony Parker sign with the Hornets, and Manu Ginobili ride away into the Argentinian sunset, things look quite different in San Antonio. The losses of Parker and Ginobili are not as significant, but they definitely signify a culture change. The West is loaded (again) this year and the Spurs are facing a long road to the top (again). The team is paper thin at guard after losing Dejonte Murray for the year and Derrick White for the opening months of the year. This team is now in the hands of DeMar Derozan and LaMarcus Aldridge, kings of the mid-range. Aldridge is coming off his best year in quite some time, so he’s expected to decline. Derozan, out of Toronto for the first time, needs to adapt quickly. Their first week is going to give some strong indication of how the rest of the season may play out, especially at the guard position. Of course, it is the Spurs and they could find someone in a trash heap and cobble together a squad for 50 wins. It’s just going to be a lot harder this year. Subscribe to get The Latest delivered to your inbox!